Ages ago a couple of members of online artist's community, Tailcast, asked me if I'd make up a lino tutorial for them, so they could see the process and have a go for themselves. I've got a bit of a summer lull in work at the moment, so I thought now might be the time to finally do it (sorry for taking so long, guys!). 1. 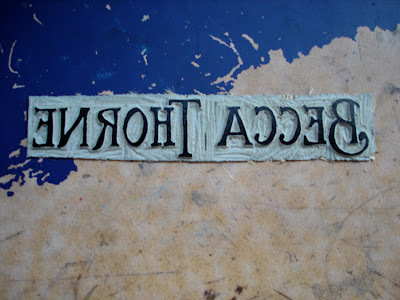 First step is to get hold of some lino. I use 3.2mm thick, from TN Lawrence, which is pretty soft and malleable, and that means you're much less likely to injure yourself than with thicker, harder stuff. They also sell Speedy Stamps, which are easier to cut than traditional lino, and good for first timers. 3. 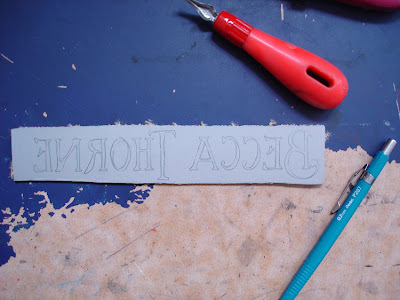 Now, using a lino cutting tool (you can get beautiful wooden ones for grown-ups, but I'm still using the plastic 'student' cutter i bought from the art shop at college. You can get them in most art shops. 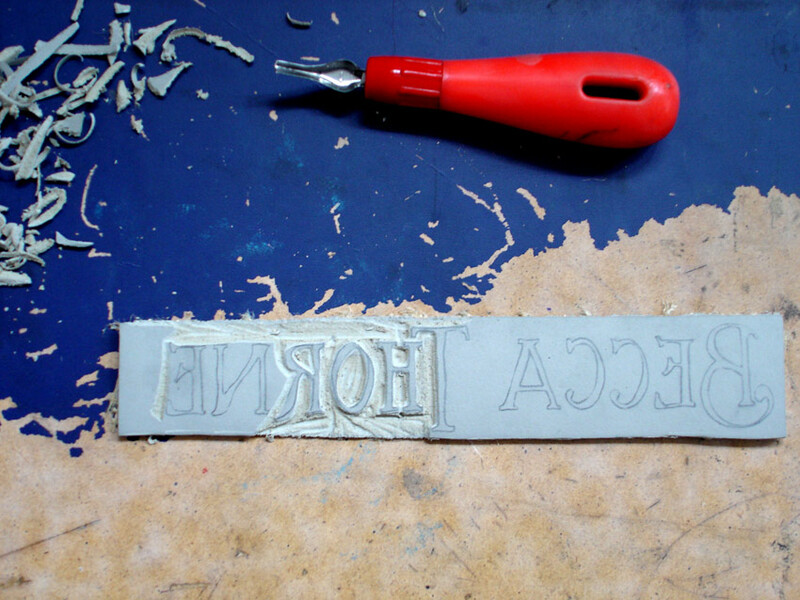 It does the job just as well), carefully, and aiming away from your other hand, cut around your design. Try not to go too deep or use too much pressure- you'll not only make it harder for yourself and make holes in your lino, you'll also run the risk of damaging either yourself or your design. 4. 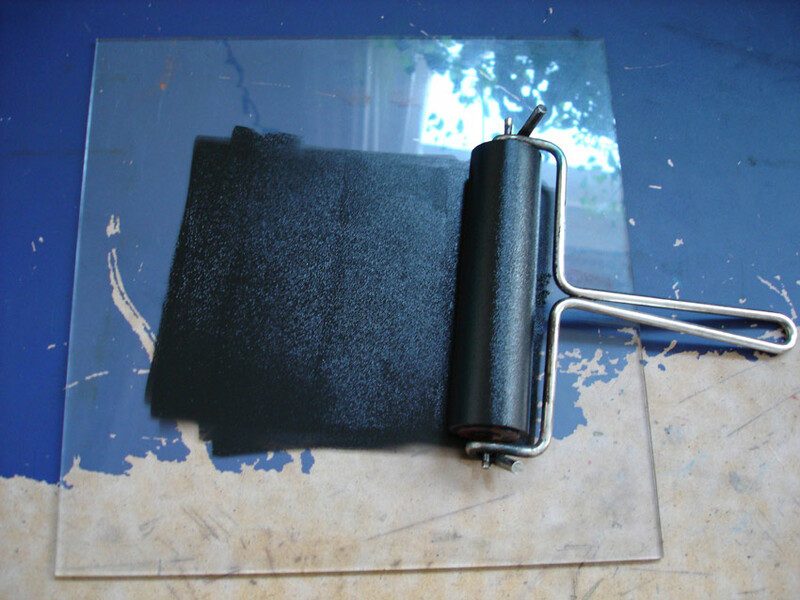 Once you're done cutting, portion out the smallest amount of ink you'll need onto a flat, non-porous surface (it's usually less than you think- too much ink on your roller will bleed all over your plate). I use Speedball water-based inks which i can rinse off in the sink without having to use harmful chemicals. They also dry much quicker than oils and there are now plenty that rival oil-based ones for intensity of colour. 5. 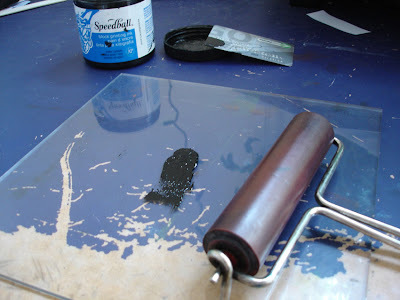 Roll the ink out until it looks smooth and velvety- if it looks gloopy then you've got too much, so either roll it out over a wider area or put a bit back. It should look like the image below. 6. Roll the ink onto your plate, taking care not to get any on the cut-out parts. If this happens use a rag- or a cotton bud for fiddly bits- to rub it off. 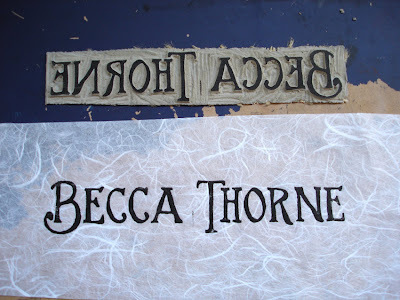 At this point you can decide how much ink you want where- if you want lighter or more textured areas, apply less ink. 7. Carefully place your paper on top of your plate. 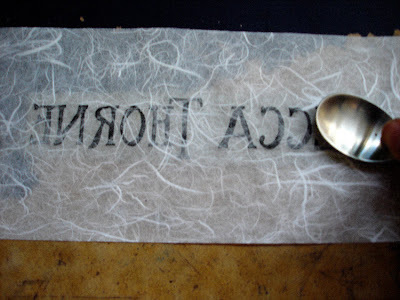 Either run your print through a printing press or, if you haven't got access to one, do as I do, and use a spoon. 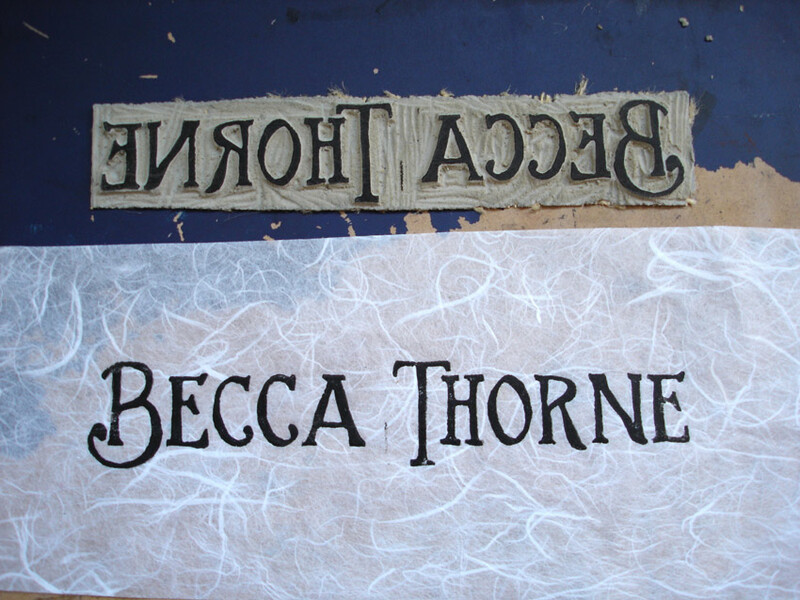 It doesn't need to be a big spoon, but it does need to be smooth- wood or rust could tear your paper. I'm using very fine paper, so I can see the print coming through already, but if you're using thicker paper, feel around for the relief parts of your plate (it's a good idea to start with the edges so you don't miss any bits) and rub over them with the back of the spoon using a firm pressure. Continue until you've covered the whole print- for reference you will see an embossed, reverse image of your design visible through the paper. 8. Now gently peel the paper back from the plate to reveal your lovely, new lino print! Marvelous. Great tutorial! We have had a wee stack of lino for months and it's calling out to be used! Get to it! Glad to have been of help!